Ann Arbor Transportation Authority board meeting (March 15, 2012): After waiting out a tornado warning in the basement of the downtown Ann Arbor District Library building, the AATA board made relatively quick work of its monthly meeting. Still, the board transacted two pieces of business. The first was to approve the report of its auditor, Plante Moran. The overall opinion was “unqualified,” which is the highest rating that can be given. Still, the audit revealed some issues that need to be addressed, one of which was dealt with as part of the audit – the recording of revenue from the tax levy in the year it’s received. That actually increased the amount of AATA net assets by $7 million, but is an accounting change, not an actual change. The auditors found one case of a contract that should have been subjected to Davis-Bacon compliance requirements but was not. Another issue identified by the auditor involves the AATA’s practice of investing in fuel futures as a hedge against the volatility of diesel prices – the advice was to review the practice with legal counsel. Plante Moran also flagged an issue involving the shelf-life of federal grants – but the AATA and auditors see that issue differently. The second business item was approval of revisions to the AATA management personnel handbook – it was part of a periodic review and revision. Among myriad other changes, the amended document adds “sexual orientation” to the list of protected classes. The board received a presentation on its audit for the previous fiscal year, which ended Sept. 30, 2011. The AATA board has typically accepted the audit in March for the past fiscal year, ending the previous fall. The AATA’s auditor is Plante Moran PLLC, which the AATA board selected for a one-year contract at its Sept. 15, 2011 meeting. A policy adopted by the AATA board on June 16, 2011 limits contracting with any one auditing firm to a total of eight years. That meant the auditing firm that the AATA had previously used, Rehmann, was not eligible to provide auditing services when the AATA awarded the contract last year. The presentation on the audit was given by David Helisek and Pam Hill of Plante Moran. Helisek described how the two had met with the AATA board’s performance monitoring and external relations (PMER) committee and had covered the audit report in more depth than the highlights they’d be providing at the full board meeting. 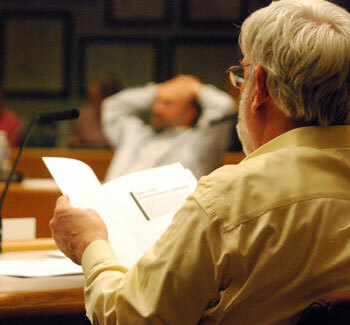 Board chair Jesse Bernstein peruses the audit report as a presentation is given by the auditors. Helisek explained that the AATA had received an “unqualified opinion,” which is the highest level that can be given about an organization’s financial statements. The unqualified opinion means that the statements provided by the AATA fairly represent the financial position of the authority. It’s the opinion that the AATA should strive for, he said. That being said, Helisek added, Plante Moran did propose something that the AATA then did, which is to record a prior period adjustment, related to the recognition of the property tax levy that goes out July 1 of every year. Plante Moran’s interpretation of the relevant standards, which the AATA’s financial staff also agreed with, Helisek said, was that the July revenue should be recorded as revenue upon levy. Historically, he said, only 1/4 of the levy was reported in the audit year, he said, with the remaining 3/4 deferred until the next fiscal year. As a result, he said, there was a restatement of beginning net assets equal to roughly $7 million. That’s an accounting change only, not a change in cash or available resources, Helisek explained. Hill continued the presentation by saying that the overall financial health of the AATA is sound. Based on the report, the operating revenue increased by about 17% over the previous year ($5,381,000 compared to $4,605,000 in the previous fiscal year) primarily due to fare increases in May 2009 and May 2010. That stacked up against an increase in operating expenses of around 3% ($29,532,000 compared to $28,673,000 in the previous fiscal year). Non-operating revenue remained flat compared to the prior year – remaining at around $20 million. Non-operating revenue is the amount the AATA receives as proceeds from the local Ann Arbor millage, as well as from the state of Michigan and the federal government. The reason that the amount of working capital is a better measure than the AATA’s income statement is that the income statement also includes a long-term view, so the income statement will factor in depreciation of fixed assets, for example. So it makes sense to look at working capital, because that’s the amount the AATA actually has available to spend, Hill said. She reiterated that overall, the amount of working capital had decreased by $200,000, which is what the AATA had budgeted and planned for. AATA has a healthy level of non-restricted net assets, Hill said, and that amount totals a little over $15 million. When you take the $7 million out – due to the restatement of the income statement, which Helisek had described earlier – the AATA is still left with a little over $8 million in unrestricted net assets. The $7 million from the restatement will need to be spent in the next nine months of the fiscal year, Hill explained. Hill said that the AATA shows good oversight over the spending process, and has taken advantage of grant money for capital items. She noted that the majority of capital items acquired by the AATA are purchased with federal money. In the federal grant award audit, Hill alerted the board to one item that she characterized as a “minor finding.” It involved compliance with the Davis-Bacon Act. Davis-Bacon requires that prevailing wages be paid for public works projects, and part of compliance is to document the payrolls. The way the compliance requirements were interpreted for one of AATA’s contracts was to not require Davis-Bacon compliance, because all the different projects completed under the contract were under $200,000, which is the amount that triggers Davis-Bacon requirements. However, compliance rules on the federal side say that all contracts over $200,000 trigger the requirement – even if the contract covers multiple smaller projects, Hill explained. So the AATA did not request or receive certified payrolls for that contract. Board chair Jesse Bernstein said that AATA staff had done a superb job. He said he wished AATA controller Phil Webb were present. [Some AATA staff who ordinarily attend board meetings did not attend, due to the inclement weather – including Webb.] Bernstein said it was just a marvelous audit. David Nacht had a question about the recognition of the $7 million of revenue. Should the AATA think about that in terms of its budgetary impact for the current year? he asked. Helisek told Nacht that the impact on the budget is negligible. Under the restatement, nothing has changed from a cash-in/cash-out perspective, he said. Nacht was worried about the impact of the restatement on the policy and the AATA’s planned investments in increased service. Has anyone thought about any of this? he wondered. Responding to Nacht, Charles Griffith noted that the restatement actually results in the AATA showing more, not less, net assets. So he felt that the AATA would not even be close to the minimum threshold. Commenting on Griffith’s remarks, Hill noted that the $7 million really is slated to be used in the coming nine months. That’s not actually available as a reserve, she cautioned. Nacht wanted to make sure that the AATA financial staff thinks about any possible implications. Nacht asked Helisek and Hill if they had any concerns about internal controls. No, replied Helisek. But he added that the audit they’d conducted is not an internal control audit. They had tested the control process and nothing came to their attention as indicating a weakness in the system. Griffith added that during the PMER committee meeting another issue had also been discussed, involving fuel futures that the AATA purchases as a hedge against diesel fuel price volatility. Griffith characterized it as an unusual and perhaps innovative practice, and said that it has saved money over the last five years. The auditors had indicated a concern that the practice might not be compliant. It should be double-checked and reviewed by legal counsel. Nacht wanted to note that while the idea of purchasing fuel futures was AATA controller Phil Webb’s idea, the board had approved it. Nacht ventured that it would require a specialized legal opinion as to whether the purchase of fuel futures by the AATA comports with state law. Based on our review of the Authority’s investment policy, it does not appear that this investment complies with the Authority’s policy. Plante Moran, PLLC discussed the investment with the Authority’s management. Based on a review of Public Act 20 of 1943, it does not appear that this investment is in compliance with state law. However, we encourage the Authority to consult with their legal counsel regarding this matter and, based on the opinion received regarding the legality of this investment, either adjust the Authority’s investment policy or appropriately adjust the types of investments in which the Authority is investing. … we noted instances where dated grants (grants that have exceeded the period of availability) are still being drawn down by the Authority and reimbursed by the Federal Transit Administration (FTA). … Although the FTA has not enforced this compliance requirement in the past, under grants that are funded with the American Recovery and Reinvestment Act (ARRA) monies, enforcement will be more stringent. Additionally, we understand that as this is being enforced under ARRA, it is anticipated that enforcement for all federal grant programs will also be more rigorous in future years. Given the significance of federal awards to the Authority, we encourage the Authority to review its processes and procedures for ensuring that grants are being spent within the period of availability going forward to ensure that awarded amounts are not forfeited. However, FTA does have the ability to require grant funds to be expended within a reasonable period, and can set deadlines and unilaterally close out grants if they are inactive. FTA has been moving to be more diligent about taking action in this area. Outcome: The board unanimously approved acceptance of the FY 2011 audit. The board was asked to approve changes to its management personnel handbook. Among myriad other changes, the amended document adds “sexual orientation” to the list of protected classes. During the board discussion, David Nacht wanted to know if the AATA’s legal counsel had reviewed it. CEO Michael Ford confirmed that legal counsel had done a review. Charles Griffith indicated that the performance monitoring and external relations committee had also reviewed the changes and unanimously supported them. Outcome: The board unanimously approved the changes to the management personnel handbook. At its March 15 meeting, the board entertained various communications, including its usual reports from the performance monitoring and external relations committee, the planning and development committee, as well as from CEO Michael Ford. The reports were abbreviated due to the short time available to complete the meeting. The meeting was roughly an hour late in starting, because of a tornado warning during which all occupants of the Ann Arbor District Library’s downtown building – where AATA meetings are held – retreated to the basement in accordance with the library’s policy. No one spoke during either of the two periods on the agenda available for public commentary. By way of brief background for some of the commentary made at the meeting, the AATA has developed a transit master plan that would include an expansion of service geographically as well as in its current service area. The AATA would like to implement the master plan by transitioning to a new countywide governance structure. 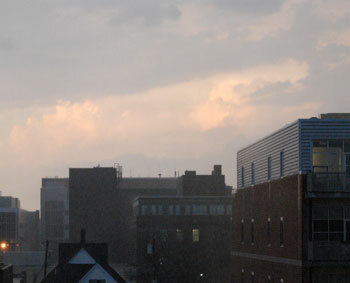 View from the top floor of the Ann Arbor District Library after the March 15 tornado warning was lifted. It was around 7:30 p.m. before the meeting began. The scheduled meeting time is 6:30 p.m. The tornado bypassed Ann Arbor, but touched down in the Dexter area and caused considerable damage. That transition would entail incorporating a new transit authority under Act 196 of 1986. To that end, an unincorporated Act 196 board (U196), with representatives from around the county, has been meeting monthly since the fall of 2011. The initial step toward the new governance and funding structure would be for four parties – AATA, the city of Ann Arbor, the city of Ypsilanti and Washtenaw County – to sign an agreement establishing how that transition could take place. During his report to the board, CEO Michael Ford reviewed the status of the four-party agreement that would establish a framework for the possible transition of the AATA to a new governance structure. Board chair Jesse Bernstein described it as an exciting month moving forward with the transit master plan (TMP). Gov. Rick Snyder, he said, had some surprises and some ideas about how to fund and structure transit. The financial task force, which has been helping advise the AATA, just did a fantastic job looking at services the AATA needs to provide in the next five years in order to achieve the vision in the TMP, Bernstein said. The group had looked at the costs and separated the federal and state-funded projects from those that are locally funded, Bernstein explained. The task force had suggested as an example that the roughly $30 million in additional revenue the plan would require over the next five years could be covered by a 0.5 countywide tax. Because of uncertainty about what might happen with respect to possible state legislation, the task force is inclined to wait to make a specific funding recommendation until it’s clearer what impact, if any, that legislation might have on the local scene. David Nacht indicated that as a new member to the U196 board, he felt like it would be beneficial for Bernstein or some other member of the U196 board to inform the full AATA board about what’s going on. By way of background, Nacht is replacing Rich Robben as a representative from the AATA board to the U196 board. Robben resigned from the AATA board and has been replaced by Sue Gott. 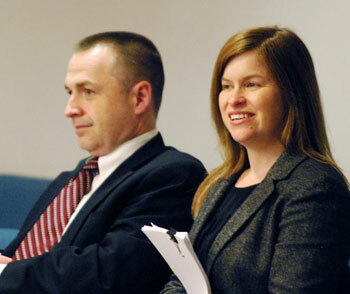 Gott was not able to attend the March 15 meeting, her first since having her nomination to the board confirmed by the city council on March 5, 2012. Bernstein, in his remarks leading off the meeting, welcomed her to the board, describing her as the University of Michigan’s university planner, and a third-generation resident of the city of Ann Arbor. Bernstein responded to Nacht’s request for a U196 update to be given by saying the U196 board has been meeting monthly. He said he’s thoroughly impressed by support the AATA is getting from around the county. He characterized the participation on the U196 board as including representatives from 95% of Washtenaw County’s population who are attending the meetings. The AATA is also still in touch with those units of government who’ve declined to participate, Bernstein said. The U196 board meetings have focused on two things: (1) education about how the transit system works and what the policy issues are; and (2) how to move forward and implement a countywide vision. The U196 board was pleased to get the report from the financial task force, Bernstein reported. The next meeting of the U196 board will be April 2, he said. In connection with the work of the U196 board, Bernstein said there was a great deal of emphasis on the district advisory committees. Representatives from the districts in different parts of the county will chair meetings, which will be ongoing. Bernstein stressed that the public input process has not reached the end of the line – it’s just the beginning. During his comments, Roger Kerson called the level of participation achieved on the U196 board remarkable, given the complexity of that process. It’s a compliment and a testament to the hard work that’s been done, he said. Charles Griffith noted that there had been another increase in ridership in February 2012, compared to last year – a raw total increase of 14% for the fixed-route service. Even factoring out the extra day in February this year and the nice weather, Griffith said, AATA manager of service development Chris White had calculated that it was around a 7.5% increase in ridership. The Canton and Chelsea express services have been increasing as well, up 67% compared to last year. That means that operating expenses have declined on a per passenger basis, which decreases the amount of funding the service requires from the Ann Arbor millage, Griffith said. Not discussed at the meeting were ridership figures for the increased Ypsilanti-Ann Arbor service provided by Route #4. The frequency of service was increased on the route starting in February 2012. The on‐time performance of Route #4 increased from 74% in 2011 to 95% in 2012. System‐wide on-time performance increased from 85% to 91%. The initial report on Route #4 ridership, one week after more frequent service was offered, showed an increase of 8% compared to the previous week and compared to a systemwide ridership decrease of 0.6%. The AATA board authorized the increased service on Route #4 at its Nov. 17, 2011 meeting. During his report to the board, CEO Michael Ford told board members that the launching of the AATA’s airport service would take place 18 days from then. He was happy to say that, he said, and indicated there’d be a press conference on Friday, March 30 at 11 a.m. to kick things off. It is good news that AATA’s audit for the last fiscal year has been delivered, and that it was unqualified (i.e. the auditors made a statement that it was in order without qualifications). However, it is important not to overestimate the meaning of this. The job of auditors is to determine that proper accounting methods are being followed, that accounts balance, and to present a proper summary of the finances at the time of closure of books. They may find evidence of some irregular practices, like failure to document certain types of expenditure, and it is good when they don’t. But their statement should not be taken as a “clean bill of health” for the financial policies of a body. I stress this because the chair of the AATA Board, Jesse Bernstein, cited the audit last Saturday at a forum as evidence that AATA’s finances were in good shape. But those statements were in fact the opinion of management, not of the auditors. Washtenaw County received awards year after year for its audits through the period when it was making investments in building projects and offering generous contract terms to employees, even as the state stopped making revenue-sharing payments and the Michigan economy was in decline. Another way to put this is that the audit is merely a snapshot in time, but budget planning is a matter of rates, trends, and preparation for unanticipated events. One wants to examine reserves in light of the rate of expenditure, plus expectations of future revenue. There should be some contingency planning, even for worst-case scenarios if possible. Any future increase in rate of spending should be judicious, given that SAFETEA-LU, the federal transportation bill, is due to expire March 31 and the House has not taken it up. In addition, the Senate has passed a new omnibus transportation bill (MAP-21) but the House version is wildly different and the prospect for moving on that is very poor. Add to these the uncertainty over the Michigan legislature’s resolution of the large clump of new transportation measures, and it looks like stormy weather ahead in budgetary terms for AATA. A good time to pull the sails in a bit. The preceding comments were assuming that readers know that Federal and State operating assistance pay approximately 60% of operating cost. Obviously, if that stable funding were interrupted, we’d have trouble.